The McHale F5600 PLUS is fitted with a servo operated load sensing control valve, which makes the baling process fully automatic. The machine is also equipped with a 25 knife chopping unit and an in chamber film bale binding system. better film or plastic coverage on the largest surface of the bale. The plastic which is added to the barrel of the bale to keep the bale together and also forms the individual wrapping layers adds value by placing more plastic on the largest surface of the bale. As the plastic is being stretched, at a high stretch ratio as it is being applied to the barrel of the bale, it expels more air than net wrap would and as a consequence results in better silage quality. As plastic is used to both bind the bale in the bale chamber and to wrap the bale, on feed out the farmer will be left with one form of waste. This reduces the time needed to feed the bale and avoids the unpleasant and time consuming job of separating the twine or net wrap from the plastic before the plastic is be recycled. In the development of the McHale F5600 Plus, McHale realised that changes in temperature and sun light could affect the chamber wrapping film, in that, as the day got hotter or cooler the film was either being overstretched or under stretched, and this in turn would cause reliability problems and result in inefficient film use. On the McHale F5600 Plus Film Binding Baler, the left hand side of the gearbox drives rollers in the bale chamber, while the pick up and chopper unit are driven from the right hand side of the machine. This system ensures direct short transfer paths and optimal power distribution. The McHale F5600 Plus Film Binding Baler is equipped with a 2.1 metre galvanised pick up, which lifts even the shortest of crop. Accurate height control can be achieved through a spring balanced hydraulic lifting system. The F5600 Plus Film Binding Baler comes standard with pneumatic guide wheels, which contact the ground on exactly the same line as the tines and guide the pick up perfectly over uneven ground. A crop compression roller is also available as an optional extra on the McHale F5600 Plus Film Binding Baler. This roller evens out lumps in the swarth and minimises the risk of blockages when working in heavy swarths. The McHale F5600 Plus Film Binding Baler is equipped with the same high capacity 25 knife chopper unit and rotor as the McHale Fusion 3 integrated baler wrapper. As crop enters the spiral rotor, pairs of rotating tines feed the crop through the chopping unit. 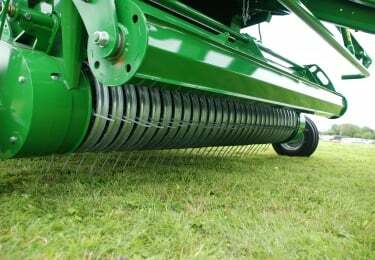 The double tines on the rotor ensure high output while the spiral layout reduces the load peaks as the F5600 Plus Film Binding Baler works in heavy swarths. 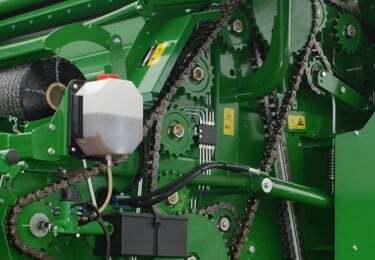 Also the rotor design maximises output by encouraging a uniform crop flow, which reduces the risk of blockages. Knives can be engaged and disengaged from the tractor cab and are protected hydraulically against foreign objects. Selectable knives provides the operator with three options. They can choose to engage and chop with a bank of 12 knives or a bank of 13 knives. Should fine chopping be required the operator can choose to engage both knife banks, which will give a 25 knife chopper system which is capable of delivering a theoretical chop length of 46 mm. The McHale F5600 Plus Film Binding Baler is designed to achieve maximum output, however as baling conditions are not always ideal, uneven swarths can occur, which can lead to blockages. 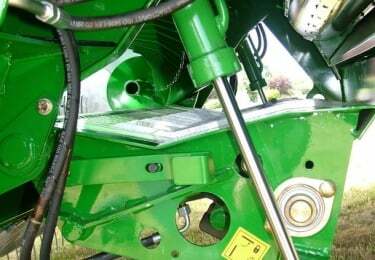 The main drive chain on the F5600 Plus Film Binding Baler is protected by a slip clutch on the PTO. Should a blockage occur, the sound of the slip clutch alerts the operator who can hydraulically lower the floor from the tractor cab. This widens the feed channel, on re-engaging the PTO the blockage will be fed through. The floor can then be reset and baling can resume. The bale chamber on the McHale F5600 Plus Film Binding Baler produces a 1.23 X 1.25 metre round bale. The bale chamber on the F5600 Plus baler is comprised of 18 heavy duty rollers. Chamber bearings are 50mm, with double raced bearings on the main load points to stand up to the most testing conditions. The F5600 Plus fully automatic baler is fitted with heavy-duty drive chains and sprockets, which ensure long life and minimum down time. 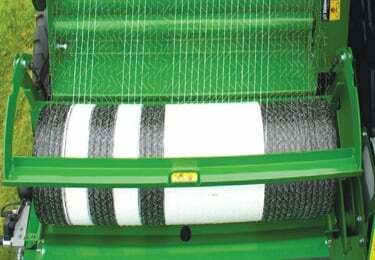 On the F5600 Plus Film Binding Baler, the roller ends are fitted with a McHale designed reverse thread sealing system, which ensures that any material, which tries to get into the back of the rollers, is automatically threaded out. 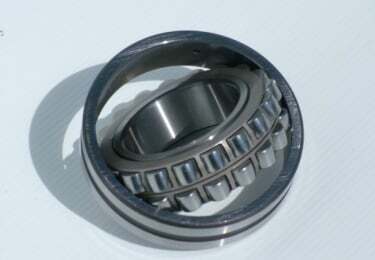 The bearings are supported by a progressive greasing system. Each time a bale is ejected from the machine, grease passes through the respective progressive blocks. The blocks measure and regulate the amount of grease going to the bearings. This ensures that the machine consistently delivers the correct amount of grease depending on the load the bearings are under. The chamber rollers, rotor bearings and pick up gears automatically receive a measured amount of pressurised grease. 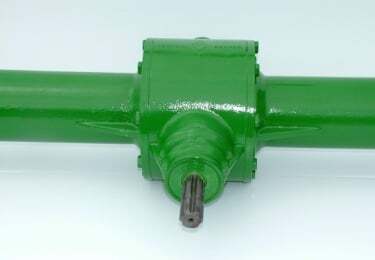 The Chamber chains, Rotor chain, Pick up chains and Pick up cam track is oiled continuously from the oil pump, which is driven by the gearbox. After a preset number of bales a lube alarm will sound reminding the operator to top up the lubrication system. Once the bale is netted in the chamber of the McHale F5600 Plus Film Binding Baler, the tailgate of the baler automatically opens, allowing the high-density round bale to be ejected. Once the bale has passed over the bale kicker the tailgate of the baler automatically closes, allowing the operator to continue baling. If the F5600 Plus Film Binding Baler is operating in hilly conditions the operator can choose to control the bale ejection process with the simple press of a button. 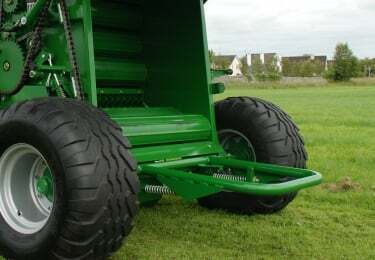 On selecting this option the tailgate of the baler will open to release the bale, close and pressurise once the high density round bale has been released. The McHale F5600 Plus Film Binding Baler has a sensor on the bale kicker, which ensures that the bale has been ejected from the chamber before the tailgate closes. The F5600 is controlled with an Expert Plus Control Box, which features a large graphic display; this allows the operator to monitor the baling process graphically from the control console. The McHale F5600 Plus can revert back to the traditional method of using net wrap and the switch over process is very simple. 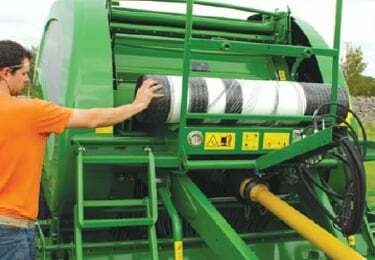 If the operator is doing hay or straw the switch back to net wrap is simple and user friendly. Net loading has been optimised on the F5600 Plus baler by the simple yet very effective rock and roll net loading system. The operator simply releases the straps on the spare roll of net on the machine platform and rocks the net roll from its storage position over the lip in the platform and rolls it into the net box. Storage for an extra roll of net is provided on the baler platform.